A little last minute holiday inspiration from the Farmgirl Fare recipe archives. These are two of my favorite dessert recipes, and they both taste even better the next day. Happy Easter! 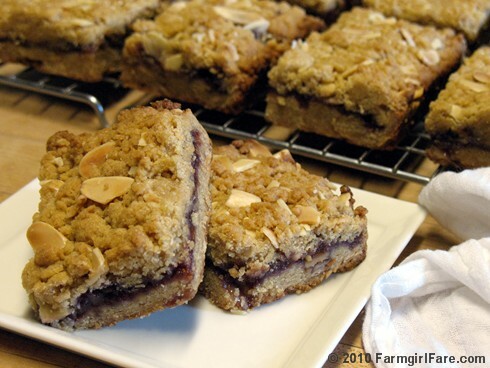 People get so excited over these Quick and Easy Raspberry Almond Streusel Jam Bars it's almost embarrassing to admit how easy they are to make. Perfect for a casual Easter dessert, afternoon snack, or sweet brunch treat (okay, I also like them for breakfast), they travel well and can be eaten out of hand. My California foodie mom brought them to an Easter celebration last year, and they were a big hit. Don't like raspberry? Just substitute your favorite flavor of jam instead. You can even make them with whole wheat flour. I created this moist Easy Orange Yogurt Loaf Cake specifically to enjoy with the beautiful ripe strawberries that were in my kitchen garden a few years ago, and then discovered it's even better with blueberries, but it also tastes great on its own. © FarmgirlFare.com, where the Friday Farm Fix should be up later today! Both look delicious, especially the cake. Mmm!